Garnier is making it easier to choose the exact shade of hair dye you need, thanks to a new collaboration with augmented reality (AR) platform Modiface. The duo have unveiled a ‘Virtual Shade Selector' tool that uses personalized technology to recommend different shades to consumers in just one minute and can be used both in-store or online, via smartphone or computer. The concept revolves around a one-minute diagnostic test, in addition to offering users the chance to virtually test out a range of the brand's recommended hair colour shades. The results are calculated by taking into account each user's current hair colour, level of gray, and desired finished look. "The Shade Selector tool is fun and easy to use," said Garnier Brand Ambassador Mandy Moore in a statement. "I'm having the best time seeing how all of the Garnier hair colours look on me -- I can go from brunette to blonde with just a simple click, it takes the guesswork out. I can trial while I'm on-the-go, at a shoot, or at home to find the shade that's perfect for me." The tool is being piloted by Walmart at 10 US locations this month, before coming to select Wakefern and Meijer stores in March and heading to 10 Walgreens stores in June. 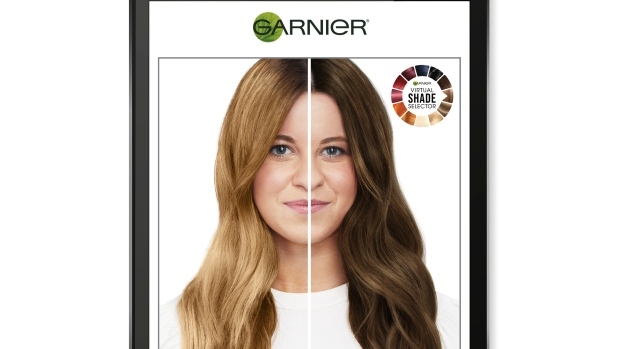 Garnier is far from the only brand manipulating AR technology to improve the hair colouring experience. In January, the Coty-owned brand Wella Professionals unveiled a new AR-enabled ‘Smart Mirror' at the Consumer Electronics Show (CES) 2019, which allows users to virtually test out different hair colours with live results, incorporating Perfect Corp's YouCam Makeup AR and artificial intelligence (AI) technology. Clairol has also been getting in on the act, launching a Google Assistant tool for Google Home last year that is designed to guide consumers through the at-home colouring process, beginning with advice on selecting the right shade of dye and taking users through the entire process of applying and reapplying the colour.